Elixir mystery is an escape room venue with unique tasks, atmosphere and an emphasis on a realistic experience. Your team of 2-5 people will be sent to a historical dungeon in the 16th century. You will have 70 minutes to escape and find a path to king Rudolf’s chamber, where the hidden recipe to the secret Elixir of eternal youth is kept. The place contains many hidden keys, clues, trap doors and fun puzzles with special effects that seem like magic. Anything that can be moved, anything you find or signals something may be an integral piece in your quest to escape (and survive). There are no special skills needed, no math skills needed, no physical skills, no specific language. You will be watched over video cameras during the whole time by our staff, so if you get stuck at some point, we can send you hints. You will need all your senses to succeed. The whole makes a unique experience. Can you make it? How to buy a gift voucher? 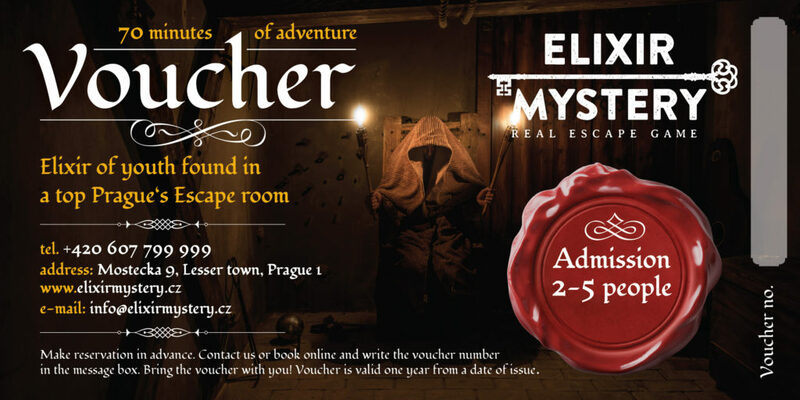 Send us an e-mail at info@elixirmystery.cz with the information below and we will send you a voucher valid for 1 year, or you can stop by our location at Mostecka 9 for personal pick-up at any time. How do you want us to send the voucher? A) by post in a gift form or B) by e-mail? Your postal or e-mail address where to send the voucher. At the same time, send the amount for your chosen voucher to our account: 92809287/2010 and enter the email which you wrote the voucher information from in the notes with the payment. After crediting the amount to our account, we will send you the voucher in English or Czech. I got a gift Voucher as a present, how do I redeem it? Just simply book your desired day and time on this web site and write the Voucher code in the Message box for us. Or contact us. Make sure to bring the voucher with you. Who is Elixir Mystery good for? Is Elixir Mystery quest scary? There are definitely small elements of fright, but that is only because of some objects, darker place or creepy sounds. We wouldn’t classify this as a “scary” experience. It is more of a mysterious and atmospherical experience. 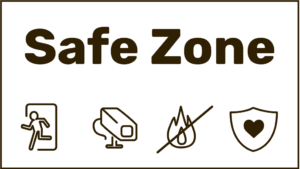 We have a official fire safety permission, electrical inspection and the whole venue is safe. All door locks are electrical, so if there is any problem, they all automatically unlock. You are also being watched the whole time, so there is no chance of getting stuck inside. You will spend here from one to one and a half hours. 10 minutes for introduction and you will have 70 minutes to complete the mission. If you are good, you might be faster. No one under the age of 9 years will be admitted. Participants 17 years or younger must be accompanied by at least one adult that is at least 18 years old, and must each bring an ID. If you arrive a little, than you can still play, but you might have less time for completament, depending on how late you arrive. If we have no reservation after you, We might let you play the full time, but it can not be promissed. How many people can play at once and what is a optimal number? What if I have a group larger than the maximum occupancy of the room? In this case management may make rare exceptions, but we strongly advise against it as the tasks and the rooms were designed according to the set capacity. It efects the game experiance. We more advise to split the larger team into smaller groups. We can give discounts in these cases. Contact us. This is completely up to you. Since there are no scarry elements or no physical action involved, Anybody can make it. Are there actors or other people in the rooms? No, there will be nobody else in the whole venue while the game is on. However, you will be watched over cameras, so we can help you if you need guidance. No, Elixir mystery is an escape game and is very different than a haunted house. You will enter the room with the rest of your team, and then be given a set amount of time to solve the puzzles inside and escape. You’ll directly interact with many aspects of the environment inside, touching things, moving things, opening things, (occasionally crawling through things) etc. There are no lines to follow or set paths to traverse, just a space full of clues, items, and puzzles. We will help you by giving clues if you need, so dont worrie about not being smart inuf to play. The payment is based on how many players are attending and is payed after the game only in CASH! We accept Czech crowns, Euro or US dollars. If you dont have Cash, there is an ATM 30 sec. walk from us. I want to book for a bunch of my friends, family or work members. How do I book more than one game? You can book as many games as you want with our booking system. Just refresh the page after each booking to start new booking. Or contact us for more games. We can provide discounts for multiple games. My business does company gatherings, do you offer Team Buildings for company outings? We do offer Team Building services. Not only will it be unparalleled with respects to adrenaline pumping fun, it is also a valuable experience for comradery with coworkers, and an insightful observation of your team’s strengths. Contact us for more information. Is it possible to book a show time outside of the current schedule? We can make exeptions and book a special time, Please contact us for avalability.